Goggin Ice Center is a wonderful facility offering rental options for teams, organizations and private parties on an hourly basis. Activities include ice skating, broomball, ice hockey or get creative…how about Dodgeball on ice? Two NHL size ice sheets are available, one of which provides a unique ‘drop-down’ wall dividing the ice into 2 individual playing surfaces. This is a great option for the extremely popular game of broomball and allows for 2 activities offered during the same ice time rental… great for youth groups! Entrance to the ice begins the rental start time…please plan accordingly. All clients are required tp sign a contract prior to the rental date. Players are required to wear certified helmets with certified facemasks closed at the chin following the USA Hockey and HECC standard. Overnight storage is not permitted without prior permission. Contact the Goggin Ice Center at 513-529-9800 for information on ice slots currently available for rent. Bookings are on a first come basis. A $75 deposit is required to HOLD private ice rental times. A signed ice rental contract and full payment is required to finalize all rentals. Goggin Ice Center has space available for your next event. 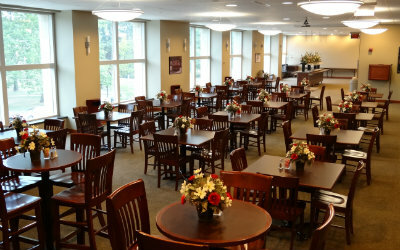 From formal dinners to team meetings, there is a space to fit your needs. 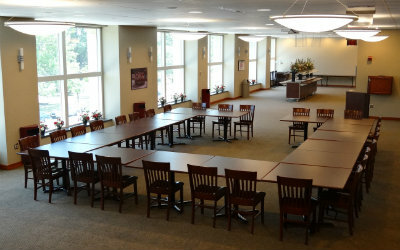 The Club Lounge offers seating for up to 100 guests with several optional layouts available. 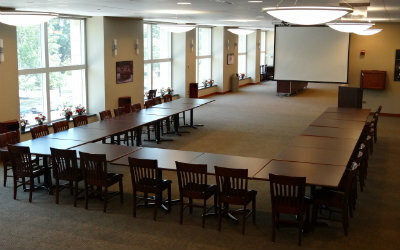 Miami mergers often host rehearsal dinners in this space overlooking the Steve Cady Arena, home of the Miami University RedHawks ice hockey team. 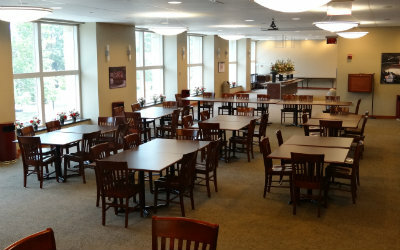 The space offers beautiful wood tables and chairs in standard and high-top seating arrangements. The space hosts 2 buffet stations along with a bar. Food and bar service is available through Miami’s Catering services. No outside refreshments are allowed. Audio Visual options include overhead projector, drop down screen, wireless microphone and podium. Optional layouts incur additional $50 fee. AV Equipment—$35 (waived for student groups). Additional meeting spaces are available to accommodate groups up to 40 and are a great option for teams to view play back video. Hook-ups and monitors are available. The room rental fee is $50 for MU-Internal Gropus and $100 for external groups. Contact the Goggin at 513-529-9800 to discuss options and to plan your next event.